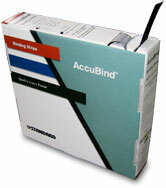 ADSS carries Tape Binding Strips that are specifically designed for the Accubind tape binding machines. These tape binding strips provide excellent adhesion while giving a professional and attractive quality to your reports. Accubind strips have a linen finish. They are available in 11" length and five widths. The tape binding strips are 11" in length, with 179 strips per roll. The woven linen textured tape binding strips provide a durable, attractive bind, great for any presentation. Available in Black, Dark Blue, Green, Red and White. Please browse our great selection of other binding supplies, including coil binding supplies, wire binding supplies, GBC binding parts, paper cutters, laminating machines and much more. Contact our product specialist today at 800.808.2377. We guarantee you will not be disappointed.